A voluntary program designed to identify barriers that prevent an inmate’s successful transition back into the community. 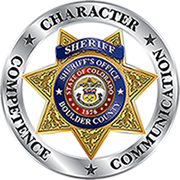 Jail staff and the inmate develop an individualized plan of action, which utilizes existing and/or newly created programs. The purpose is to build skills and competencies, which increase the probability of success for the inmate upon entering a less restrictive environment. An inmate may lower the risks of release, while reducing the time spent in jail by active participation in this program. Participants will engage in Evidence Based Educational Programming (EBEP) based on their assessed needs. Such subject matter as listed under education programs are available to participants.